World Bank complemented India’s initiative of ensuring that the structural changes in easing the regulations around business are not only limited at the national level but has percolated to the local. India’s business ranking in the World Bank’s Ease of Doing Business report to the 100th place and bankers and experts have expressed the hope that GST will strengthen the country’s position in future. The significant jump this year is a result of the Indian Government’s consistent efforts over the past few years and India’s endeavor to strengthen its position as a preferred place to do business. resolving insolvency,access to credit and protecting minority investors. The recent policy initiatives including Demonetization and GST are driving a positive overhaul of the economy. There are many illustrations which helps in achieving this ranking such as online payments to Employee Provident Fund and administrative measures to simplify corporate income tax regulations led India to jump 53 places from 172 to 119 on the ‘paying tax’ parameter. One of the main reason by which India’s rank changed is enactment of the Insolvency and Bankruptcy Code and actions that helped India move from 136 to a rank of 103 in the ‘resolving insolvency’ parameter. Though India improved its position by six ranks from 185 in 2016 to 181 in 2017 vis-a-vis getting construction permits. By March 2018, construction permit will go online for all 500 cities selected under the Government’s Urban Upgrade Scheme, Atal Mission for Rejuvenation and Urban Transformation. Nestle’s Chairman said top priority should be given to investments in building agricultural capacity throughout the challenges of scarce natural resources, rising population and growing food demand. 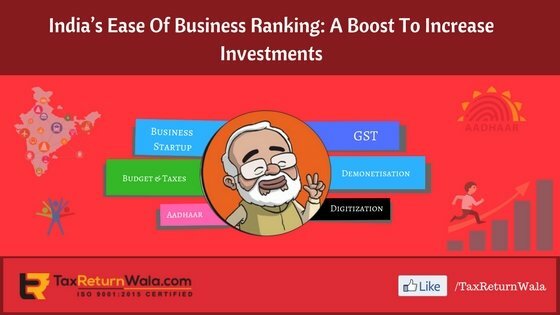 The pace of development has been impressive in the last few years, praising the Government for improvement in India’s business ranking in World Bank’s report on ease of doing business. The changing environment boosts the prospects for retailers and wholesalers like metro. The Government could place a positive role by creating a certification system that can only recognize manufacturers who have achieved world class standards that helps in to bring manufacturing units and world class technology and hygiene. Tata group will continue to invest in technology and resources in a growing food processing sector. The improved investments climate will give a boost to several economic corridors that are ready for investors. The next paradigm shift to the top 50 is still a long way ahead and will require India to maintain a strong momentum. The GST reform that did not get considered this year will drive India’s improvement in next year’s assessment, but there is a need to continue to work on other areas, including starting businesses, trading across borders as well as land reforms. India has to sustain the momentum towards a higher ranking and also to secure changes in the remaining areas will require not just new laws and online systems but deepening the ongoing investments in the capacity of States to implement change and transform the framework of incentives and regulation facing the private sector.